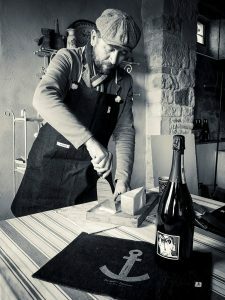 Riccardo Zanotto it’s me, I have my own idea of what a wine should tell when you taste it, whether it be a simple still wine that one Doc Prosecco spumante wine or sparkling “Col fondo” with second fermentation in the bottle. I wish that whoever drinks one of my bottles should find in it the stories of the past, the scent that made me fall in love with it and that peculiar personality that distinguishes me because it’s witness of a particular territory. And this is what I became in the course of the years, a tailor that selects quality, taste and tradition. Every year I create my sparkling wines “Col Fondo” (fermented on leeds), my still wines and my Spumante Prosecco DOCG Conegliano Valdobbiadene but do not own vineyards. It is a conscious choice, thanks to the collaboration with a trusted manufacturer and the advice of an oenologist, allow me to put in my bottles exactly my idea of wine. But what most would like to convey with my wines, beyond any technical and tasting note is the return to live wine with simplicity and conviviality. Take your noses off the glasses and put aside the technical files. Let’s go back and drink like we would do in an “Osteria”, let’s go back and spend time together.